The oval is the rotary, with the underpass below. The large roof on the right is the Schrafft’s building. Sullivan Square station is just off the page to the left adjacent to the parking lot with the yellow stripe. Red arrows: 9 lanes coming into a single signalized intersection (with 2 traffic lights) where only approx. 2 lanes can move at a time. Nearly all traffic in the area must come through this point, so the rest of the rotary area serves little purpose. Yellow arrows: drivers on Rutherford Ave and Main St get backed up because they cannot get into the rotary due to the vehicles coming out of the traffic signal (red arrows) in big groups. Well functioning rotaries do not have signals on them; instead, traffic flows in and out of the rotary naturally. Orange star: even before the northbound underpass was closed, less than ¼ of all drivers in the area (equal to only approx. 1 lane of traffic) used the underpasses. All underpass space is dedicated to people traveling to and from Everett while people going anyplace else compete for space at the surface. In the 2012-2013 effort, the City quickly decided that underpasses were not needed at Sullivan Square and the discussion quickly focused on Austin Street. Time was then spent planning for a future where pedestrian-oriented development could be built on the new blocks formed right next to Sullivan Square Station. Now, BTD has reintroduced an underpass option at Sullivan Square. In the Surface Option, the existing underpasses will be filled in, the rotary will be eliminated, and a grid pattern will be created to move traffic. Pedestrians will have a much easier path to the Sullivan Square T Station and the open space will be continued to the Mystic River. In the Underpass Option, the underpasses will be rebuilt. They will be shorter in length than today - running from just north of Baldwin Street to just north of Arlington Avenue (across from the Ryan Playground). Even though both options can accommodate future traffic demand, they offer different benefits to the neighborhood. The design creates a grid pattern that will provide drivers with multiple routes to get through the area, unlike the existing rotary which requires everyone to go through one point. - New block pattern allows multiple routes. - Rutherford Ave becomes 2 lanes in each direction with a left turn lane where needed. - Pedestrians can get through much more safely with new cross walks and signalized intersections. - Traffic signals will be interconnected electronically. Moving traffic is relocated away from the neighborhood, providing green space, parking and a walking/biking path on the neighborhood side of the street. 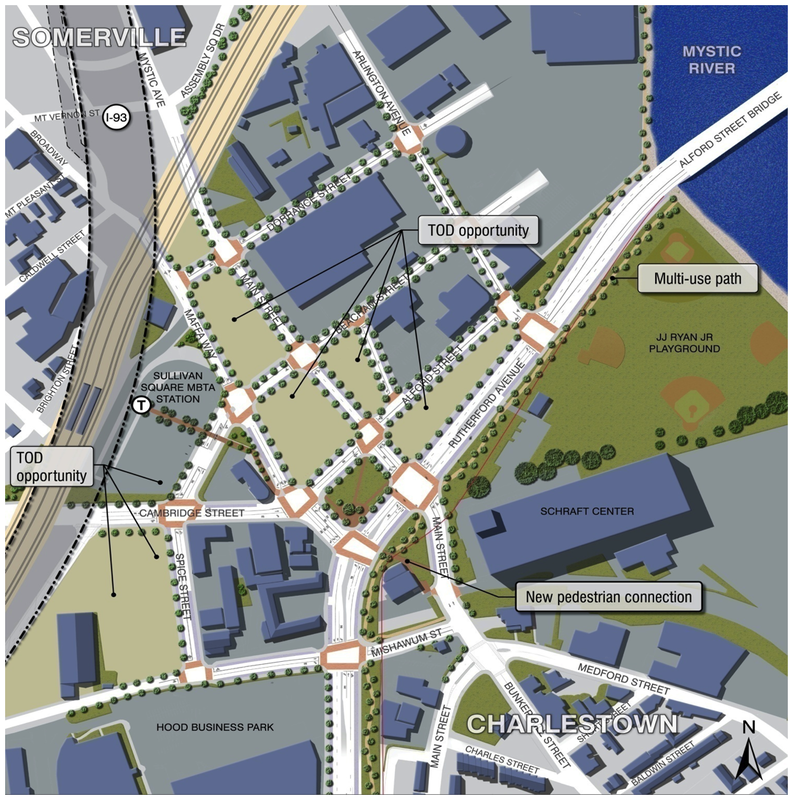 In the future, cyclists and pedestrians can connect to Assembly Square in Somerville by crossing Rutherford at Arlington Avenue / Ryan Playground, following along the west side of Rutherford Ave to the Mystic River. There they will find a path along the river to Assembly Square . A new plaza is added in the center to replace the former Sullivan Square Park which was demolished for the rotary. People leaving the Ryan Playground will be able to get home without leaving the neighborhood. This is a BTD visual showing the lanes in the Surface Plan. The two lanes each way on Rutherford Ave will extend to the Washington Street bridge to the North End. All signals will be connected electronically to ensure traffic flow. From the downtown command center, BTD will monitor and can manually change the signal timing if congestion occurs. This will be especially helpful when large events like games at the Garden or 4th of July fireworks occur. The road and block pattern in the 2017 Surface Option for Sullivan Square are largely the same as seen 2013 and included in the Sullivan Square Disposition Study. In the plan to the right, white represents roads, pink show blocks that could be built upon, blue are sidewalks and paths, and green is open space. The Ryan Playground is on the right side of the image with the Schrafft Center below. It is hard to see, but they are showing 2 lanes on Rutherford Avenue northbound until Spice Street, when a 3rd lane is added. Three lanes are continued until the Alford Street Bridge - a bridge that has 2 lanes each way. Main Street and Maffa Way will be one-way streets, as they are today. Signalized intersections are shown with black dots. New green space is shown along the length of Rutherford Ave and also on Main Street in front of the Schrarft Center. BTD consultants reported that the open space may be up to 65 feet wide for much of the length of the roadway. The plan provides for seven parcels for new development including affordable and market rate housing, ground floor retail in some locations, and office space (see blocks colored in pink). The Underpass Option presents a very different picture of Sullivan Square. In the May 2017 version of the underpass, BTD relocated it so it is closer to the Schrafft's building. If traveling south from Everett, drivers would enter the underpass after passing through a left turn signal (see red arrow). A trench would exist from the left turn until near Mishawum Street (see image below). A new dead end street would be built to provide access to the Ryan Playground. - A large open trench would exist, largely in the same place it is today. BTD has discussed the possibility of air rights development, but significant issues/impediments exist. First, air rights development is very costly since the developer must build a deck over the trench. Second, a significant portion of the trench will be too shallow to ever have any development above it. - The trench will affect four out of eight blocks included in the MAPC reuse plan for the area. One of these blocks was planned as a central park that would serve the area. The other three were to be used for pedestrian and transit-oriented development, including potentially affordable housing. - The BTD's graphics for the underpass do not color in the open space, so we have tried to do so (see green color, while allowing for space for the retaining walls. What can be seen is that there will be no room for open space immediately south of Sullivan Square (see image below for wider view). The space allocated to the shared us path is the existing surface parking lane in front of the granite business at the rotary plus the existing sidewalk. This is very narrow given the number of people who will be traveling to and from the MBTA station. - Pedestrians traveling to the MBTA station will have to cross at least one, if not two, 6-lane streets. - The area is one of the most prone to flooding in all of Charlestown and it is counter-intuitive to seek to build an underpass in a location likely to be flooded at some point in the future (see climate resiliency page). The southern end of underpass will be at Baldwin Street, a few hundred feet north of where it is today. Nevertheless, the width of the underpass will affect open space between Baldwin Street and Sullivan Square. The area will effectively be the same as it is today, with the exception that the existing parking lane and sidewalk will be converted into a shared use path. Of concern is the fact that the path will be immediately adjacent to moving traffic. If someone walks on the existing sidewalk today, they are at least separated from the moving cars by the parking lane. For the shared use path to encourage use of the Sullivan Square MTBA station, walkers and pedestrians will need to feel safe and comfortable the entire length of the way. That will not be the case without the open space buffer. The roadways included in the underpass roadways are nearly identical to the rotary today. The only exception is that a left turn is needed to enter the southbound tunnel and a frontage road has been added to allow access to the Ryan Playground. See 3D images below. In stark contrast, the surface option enlarges the open space next to the union building and adds open space in front of the Schrafft's Center. The area of the rotary and the underpass ramps, where no one can go now, will be filled with 3 new blocks of pedestrian-friendly development and a new rectangular park. Sullivan Square will be a place for people once again, as it was when the train station was located there (see Charlestown history page). A 3D image of the underpass option shows the huge land area in the middle that will not be occupied since they will be next to roadway trenches. Also, the lost opportunity for new housing or businesses is clear. Note that this is the February 2017 underpass option. In the May 2017 version, the underpass is moved more to the right, but the width is the same. The underpass today runs from just below Essex Street to north of Arlington Avenue (3,400 feet). In the new underpass alternative it will be reduced to going from Baldwin Street (near Santander Bank) to just north of Arlington Street. (1,900 feet), This is still move than 1/3 mile (.36 miles) in length and is not consistent with the City's plans to balance the needs of motorists, pedestrians, and cyclists.